There’s a new waft in the air throughout Universal CityWalk – the scent of something sweet and a little something devious. 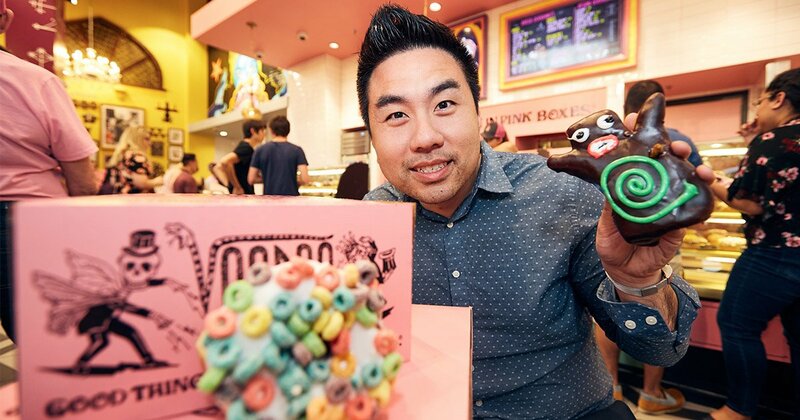 The world-famous Voodoo Doughnut, based out of Portland, Oregon, has brought its sinfully delectable doughnuts with a cult-like following east of the Mississippi for the first time ever. Voodoo Doughnut is now open at CityWalk. They say good things come in pink – a hint at the delights found inside Voodoo Doughnut’s pink doughnut boxes. In many ways, Voodoo Doughnut is like a theme park with thrilling rides and entertaining attractions just for your taste buds. As you walk up to the storefront, you’ll see a throne fit for any sprinkle king or Instagram model. Queue up and soon you’ll enter the shop of scrumptious pleasures. The walls are decked with pink and eclectic décor, plus – a skeleton bride and groom greeting you from above. These charms and spells are all a part of the quirky, psychedelic funk atmosphere that the owners Kenneth “Cat Daddy” Pogson and Tres Shannon bring from Portland. There’s a rotating display case featuring over 50 types of doughnuts. They’re made fresh in the shop every day! Peer through the magical glass wall to see the staff as they handcraft their next batch of doughnuts. Watch them, these voodoo priests, as they breathe life into their doughnuts behind the counters. The doughy delights at Voodoo Doughnut are what dreams are made of—crispy, crunchy on the outside, melt in your mouth fluffy on the inside. There’s the classic yeast doughnut and cake doughnut, but also many vegan doughnuts as well. The doughnuts, as you can imagine, are quirky, too. Each with their own personality some might say. The raspberry jelly-filled Voodoo Doll doughnut is the classic signature doughnut. It’s chocolate frosted, with its arms outstretched and a gaping mouth aghast, maybe due to the small pretzel stick stuck in its chest. There’s also the Memphis Mafia, a twisted take on the classic Apple fritter. It’s a sweet and fried incantation stuffed with banana chunks and cinnamon, covered in glaze, drizzled in chocolate and peanut butter, and topped with peanuts and chocolate chips. It’s a-hunk-a-hunk of delicious love. The folks at Voodoo Doughnut pride themselves of their crazed concoctions, including the sweet and savory Bacon Maple Bar, which is a yeast doughnut with maple frosting and bacon on top. Doughnuts are an American breakfast tradition—and so they’ve come up with some concepts that are derived from this favorite meal. The Loop and Oh Captain, My Captain are both cereal-inspired doughnuts that will bring you back to those childhood Saturday mornings in front of the TV. So come on down to Voodoo Doughnut soon – their delightfully weird and sinfully delicious doughnut creations will put a spell on you and your whole family, too.